Perfect for travel or for every day! While we all want to give that perfect gift this holiday, it’s important to do a little research. When it comes to earrings, all are not created equal. Size, of course, is a big consideration. If you’re buying a pair of earrings for your wife or mother, take a look at the earrings she currently wears. Heavy earrings may not suit your diamond-stud wearing wife! Chandelier – very popular the last few years. As the name implies this style of earring has multi-level branches that hang down from the earring base. Normally gemstone briolettes (tear drop shaped gems) hang from the branches. Drop – usually one larger gemstone, geometric shape or charm hangs from the earring base normally facing forward. Some drop earrings combine a charm and a gemstone. The basic design of the drop requires the earring to hang in a straight line from base to end. Hoop – Angelina Jolie is the queen of the gold hoop earrings. As the name implies this earring is round or slightly oval and runs through the piercing in your ear. Hoops come in many circumferences from quite tiny to shoulder dusting. Stud – Round gemstone earring with a post and earnut that goes through the post at the back of your ear to hold the earring on. 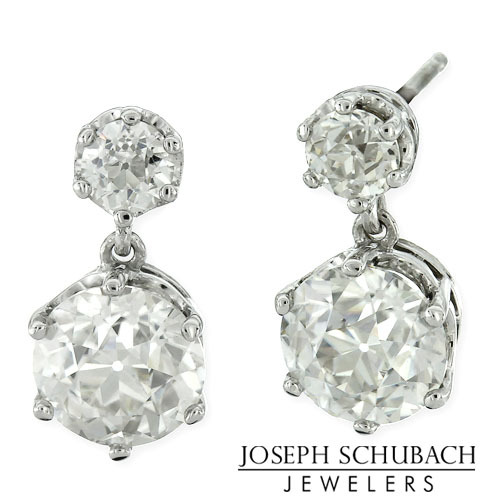 Diamond studs are a classic look that are appropriate worn with ripped jeans to evening gowns. French Hoop – a rounded hanger that is open at the bottom to allow it to past through your piercing. Leverback – made for both pierced and non-pierced earrings. The back of the hanger flips up to press against the back of your ear to hold the earring in place. Screw On – non-pierced earring hangers with a terminator that screws up against the back of your ear to hold the earring in place. Rarely seen now except with vintage earrings. Most screw on earrings are extremely uncomfortable to wear for any length of time. 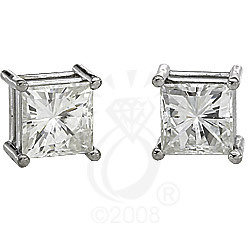 Classic prong set stud earrings with Charles and Colvard created princess cut moissanite. On Sale! Save 60% on select items. 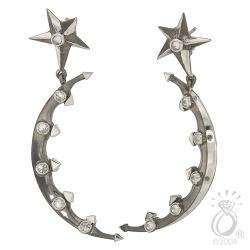 These "Moon and Star" diamond earrings are probably a bit different from what you’ll usually see. Designed by Joe himself for a client who prefers unique jewelry, this pair of earrings is crafted in 18kt white gold and given a black rhodium finish. They contain over one carat of natural round brilliant cut diamonds set in reverse, with the points of the stones facing up. Yes, you read that correctly, the diamonds are set up side down. Click on the image for a better look. We would love to hear your opinion on these! 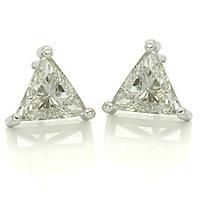 We just made this pair of natural trillion shape diamond stud earrings. They weigh just over 2 carats in total but they look much larger, more like 2 carats each! Trillion shape diamonds are generally cut wider with less depth than other shape diamonds. This gives them a much larger look for the size.